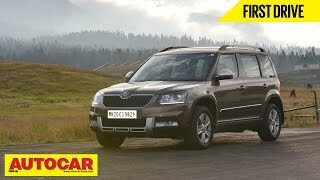 Skoda has revealed the 2014 Skoda Yeti facelift, a compact SUV which will have its premiere at the 2013 Frankfurt Motor Show in September. Skoda is offering for the first time two individual design ranges, the white one is destined for the city while the green one has an off-road look. The difference is the front and rear elements, such as bumpers, underride guard, side mouldings and door sills which on the city version are painted in same color as the body color and the outdoor version remains in black plastic. 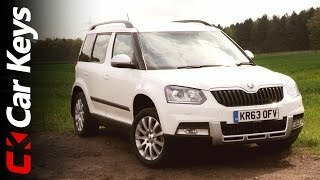 The Compact SUV Skoda Yeti features a distinctive grille, redesigned headlights with an option for Bi-Xenon headlights with integrated LED daytime running lights, a sportier front bumper and a new form of tailgate with distinctive tail lights. The 2014 Skoda Yeti is the brand’s first model with Optical Parking Assistant, an optional rear-view camera. In no other compact SUV do the rear passengers have as much headroom as in the Skoda Yeti - 1027 millimetres. The boot capacity is at least 405 litres. Taking all the rear seats out increases the volume to a fantastic 1,760 litres. The new Yeti models have got an all-new fresh interior - with new 3-spoke steering wheels in seven variations, new fabrics and patterns for the seat covers as well as new decorative trims on the dashboard. The 2014 Yeti is available with a choice of three gasoline and four diesel engines, with output ranging from 105 HP (77 kW) in the 1.2 TSI to 170 HP (125 kW) in the 2.0 TDI. Front- or all-wheel drive system is available, along with six-speed manual or six- and seven-speed DSG depending on the engine choice. The GreenLine version 1.6 TDI/77kW, with front wheel drive and a manual gearbox, produces CO2 emissions of just 119 g/km. The Green tec package includes the Start-Stop System, brake energy recovery (recuperation) and low rolling resistance tyres.